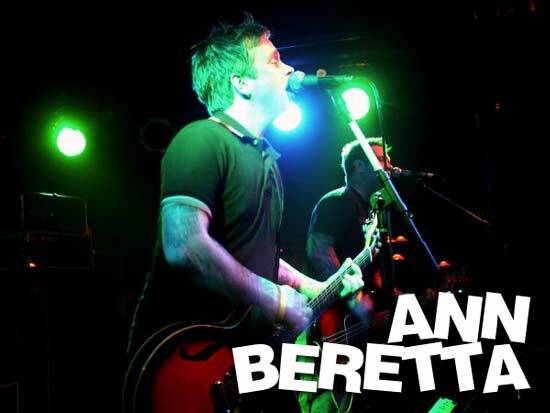 Richmond punk legends Ann Beretta recently returned for two shows this year, including a stop at The Fest 7. Scene Point Blank caught up with guitarist/vocalist Rob Huddleston and discussed the band's latest shows as well as the future with his solo project Foundation. Scene Point Blank: Ann Beretta recently reformed after four years of inactivity/hiatus. Was it hard to get started again or did things pick up where you left off? Rob Huddleston: No it wasn't hard at all really. We had been playing music together this whole time playing shows as Foundation, which is my solo project that I started to put a little more focus on. The hardest part I guess was remembering some of the old songs from "Bitter Tongues." We had decided to revisit a lot of "Bitter Tongues," which was really cool to do. We hadn't played many of those songs in quite a while so there was some re-learning to do. Scene Point Blank: What lead to the reunion? Did the reaction to the Inquisition shows affect your decision? Rob Huddleston: No, it wasn't that as much as it was that we had been wanting to play shows for a while and the time just seemed right. We stopped playing shows after some really bad times with record labels, agents, and managers. We had finally gotten to the point where we thought we could have fun again and play shows that we wanted to play with no pressure of selling records, touring, or really caring if anyone showed up or not. It was all about having a good time. We thought that playing a few local shows with friends and some select fests would be a great way to pick back up with no agenda at all. Scene Point Blank: When you play now, do you mostly see older faces or is there a new generation of fans? Rob Huddleston: I think both. The festivals we've done have been 50/50 but the headlining shows have been mostly old fans. Many are traveling to see the shows so the people who are there really want to be there for all the right reasons and the response has been really great. Everyone is singing along and it's felt really great. Scene Point Blank: Will The Fest close the book on Ann Beretta? Rob Huddleston: It will close the book on what we planned on doing this year. I'm sure it won't be our final show ever but it is the last show that we had planned on playing this year. I'd love to play a few more shows here or there, I'd love to go to Europe and play some shows but as of now we have nothing planned. Scene Point Blank: It's been over a decade since Ann Beretta formed. How has the Richmond scene changed in that time? Rob Huddleston: I think Richmond will always have a great music scene. There's a big college and art school that brings new kids to town every year that start new bands. Richmond has always instilled a real hard working, grass roots sort of ethic in its bands and I think that's why you hear so much about Richmond bands. Scene Point Blank: If somebody told you ten years ago that you'd be playing a final show at a Gainesville punk festival, would you have believed it? Rob Huddleston: Sure - I think. I mean ten years ago the thought of playing a festival anywhere was something we didn't know would ever happen. We decided that this show would be our "last" official show because of our history with Gainesville?it's like our second hometown, so it seems totally fitting. Scene Point Blank: Is there a forthcoming DVD or b-sides record or anything? Rob Huddleston: Again, nothing planned. The Insubordination Fest was recorded and filmed. I know they'll be releasing a comp and they have asked if we wanted to release a DVD but I'm not sure if we'll do it. I hope to record or film the set at The Fest, but who knows? We have some unreleased material and some live recordings that I think are pretty good, but I don't really know if it's anything that anyone would want. I would like to see "Bitter Tongues" get re-released, maybe with some of that stuff as bonus material. Scene Point Blank: How did you decide on where to have your "final" show? Rob Huddleston: Well, I think we kind of decided to have two "final" shows. One in Richmond with Weston that we recently played and then this show at the Fest. The show with Weston was really cool. We played our first show as Ann Beretta in October of 1996 opening for Weston in Richmond so it was cool to play what we considered our last official show in Richmond with them. It was a great show and we played l think for over an hour and a half and played mostly songs from "Bitter Tongues" so it was really cool. The Fest , aside from being in Gainesville, just seemed like an opportunity to play in front of a lot of people for possibly even the first time but more importantly along side of some really great bands that we've been friends with for a long time. A lot of them have gotten in touch with me lately to say how excited they are to see us again. Scene Point Blank: Have you played at the Fest before? Rob Huddleston: We played the first two or three years. Scene Point Blank: How did you get affiliated with it? Rob Huddleston: My friend Tony is responsible for the whole thing. He started a similar fest in Virginia called MacRock when he was in college. When he started putting the first Fest together we jumped on right away knowing that it would be a great time. It's grown into such a huge beast and I would say will soon take over and be bigger than SXSW. I know every punk band out there looks forward to playing this every year. Scene Point Blank: How is the Fest different than MacRock? Is it just the scope of the event? Rob Huddleston: Mac Rock was sponsored by the college (JMU) in Harrisonburg, VA and was similar in the sense that it was many bands playing over a weekend at multiple venues, house shows, etc. I haven't been to it in a few years but I think we played the first three or four and every year it got bigger and better. Like I said, Tony was responsible for putting this together and building it up and making it something really cool that still happens every year - even several years after Tony's involvement. Scene Point Blank: Do you know if there's a fear of The Fest blowing up - getting too big for it's original crowd? Rob Huddleston: I don't think so. I think the bigger the better. I think at some point you can only have so many bands play over three days so maybe it goes longer in the future but I don't see it getting too big. Scene Point Blank: Moving on to Foundation, is it now going to be a full-time project? Rob Huddleston: Sort of. I have a new record coming out and I have plans to travel a bit and play some shows. We'll just see how it goes. I'm working with Vinnie again and his new label, Paper and Plastick, which is good times. Vinnie is releasing everything on vinyl and digital download. The records are packed full with amazing artwork and I really can't wait to hold this thing in my hand. For anyone not in the know, Vinnie used to own Fueled by Ramen who released the first two Ann Beretta records as well as the first Foundation record. Scene Point Blank: The vinyl comes with the download code for free, or is that an additional purchase? Rob Huddleston: You'll be able to buy the download separately but the LP will come with a download card so you'll get both with the vinyl purchase. Scene Point Blank: You're working with Vinnie again after issues with other labels. What does he do best compared with other labels? Rob Huddleston: Vinnie has great ideas and I trust him on many levels. I know he only wants to put out great records and art with great people so I'm really happy that he even wanted to put this thing out. I've heard him often talk about the first Foundation record on Fueled by Ramen as being one of his favorite releases and once he told me about Paper and Plastick, his new label, I was very excited and couldn't think of a better place for this new record to be. Scene Point Blank: Will Foundation be all new material, or will there be some re-working of older Ann Beretta material like on the first record? Rob Huddleston: No, it's all new songs. I had almost three albums worth of new songs written before starting this record. I'm hoping that after it comes out we'll put out an EP with some of the songs that were recorded but not used. I'd also like to release a seven inch or another EP of a few of the demos?and then there's new songs that I've written since that I'd like to record soon. I've got a full band on this record so it's different in that aspect as well. Scene Point Blank: Acoustic music seems to be more popular in the punk world than it was in 2001. Have things like the "Revival Tour" helped open the door? Do you see a difference in your audience compared with when you started doing it? Rob Huddleston: Well, it's definitely more popular and every singer in every somewhat successful punk band seems to be doing it. When I released the first record I was the only one out there doing it really. And before that, Ann Beretta had released an acoustic record in 1998 and no one - I mean no one - was doing it then. I'm not saying that I started the trend but I certainly was doing it before it was the norm. But, honestly, bands like The Alarm were doing it way before I was. As far as the audience: they seem to be older, not as many teenagers. I think we've all just gotten older and are more open to different things and can relate more to it. When I play shows now it's always different. I play solo - as in alone with an acoustic guitar - or with a full band that varies between four and seven players. Sometimes the band is all electric, sometimes all acoustic and sometimes half and half. It's really what I like the most about playing this type of music - it really can be done so many different ways and have a different feeling or impact depending on how it's presented. Scene Point Blank: It's sometimes solo and sometimes a group. How does that work with touring? Do you just bring whoever can take the time off work? Rob Huddleston: Exactly. I've committed to doing several dates a month after the release, which will involve a lot of flying across the country, and some driving up and down the east coast. It will really depend on the expenses and budgets involved as to who comes with me but I hope to always have some accompaniment. One good thing about doing shows this way is that the audience always gets something different too. Scene Point Blank: Since you're not playing traditional punk rock, do you often get booked with different types of music that you've never shared the stage with before? Rob Huddleston: Yes and no. I think early on after the first Foundation record I would go play shows and tour by myself and I would get put on shows with punk bands and would be the odd man out. I would be the only guy without a band or with an acoustic guitar. I don't think that promoters in the punk/indie world knew what to do with me then. Lately I have had the chance to play with all kinds of bands/artists that I would never have been able to. I recently played with Natasha Bedingfield who I hadn't really heard of other than knowing she was some British pop singer. I've played recently with Shooter Jennings, which was a blast, and of course my friends like Chuck Ragan and Tim Barry or Drag the River who are all doing something similar. Scene Point Blank: Is it refreshing or intimidating to be exposed to a new audience like that? Rob Huddleston: It's really cool actually. I've made some new fans and friends. 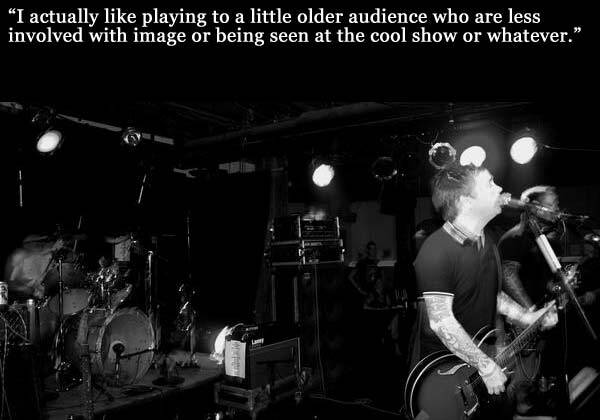 I actually like playing to a little older audience who are less involved with image or being seen at the cool show or what ever. I like the fact that a lot of the old Ann Beretta audience has grown with me and followed me along the way. The response to the new stuff has been really great, especially with the full band. I really have a blast playing the new songs and we have been known to throw in a song or two from the first record as well as an occasional Ann Beretta song which is always fun. Rob Huddleston: No problem, thanks for talking to me. Posted May 20, 2017, 11:21 p.m.
Posted Sept. 8, 2013, 10:14 a.m.